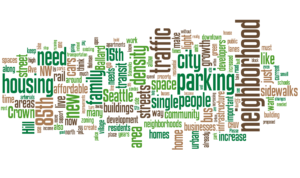 As the Seattle City Council gets ready to meet this afternoon to decide whether to approve zoning changes recommended by the Mayor’s HALA Committee; a survey fielded by Crown Hill Urban Village Committee for Smart Growth shows overwhelming community interest in planning before rezoning a large swath of single-family homes in one of the largest expansion areas in the City. Renters and homeowners alike shared these values, with little difference in responses on these three recommendations to the City on growth in Crown Hill. For complete survey results, including top infrastructure priorities, ideas for future growth and over 500 comments from neighbors in and near Crown Hill Urban Village, visit our website.